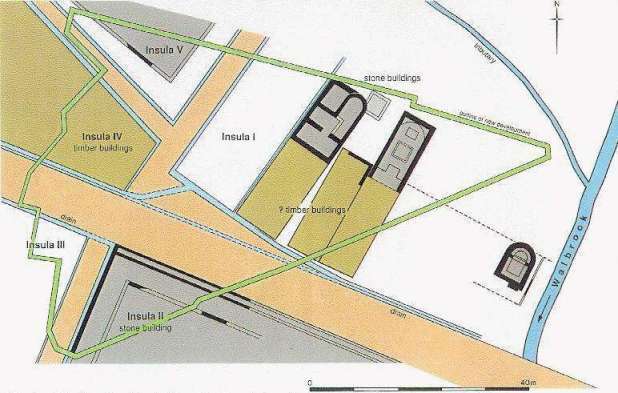 Following on from our post about Grimes and Williams’ excavations at the Temple of Mithras, we’re going to take a short hop across the road to the nearby excavations carried out at No.1 Poultry. The Poultry site under construction. The large grey building on the far right of this picture is Bucklersbury House; the location of Grimes’ 1954 excavations. 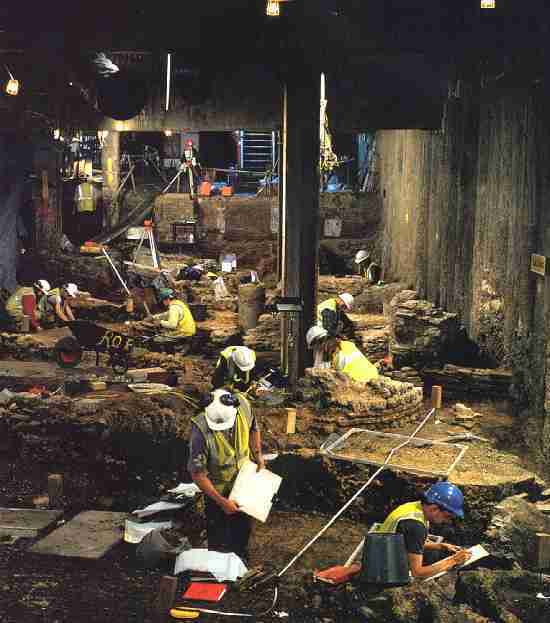 This 1994-1996 excavation was very different from the one that W.F. Grimes conducted in the 1950s. Rather than a small team of archaeologists monitoring teams of untrained labourers and making brief notes from the top of the trench, the Poultry site was dug and recorded entirely by professional archaeologists, with labourers providing support from the top of the trench by working the hoists and machinery used to remove spoil. Whilst Grimes could only dig a series of slot trenches across his vast site (only discovering the Temple of Mithras by chance) the Poultry archaeologists excavated and recorded everything that would be in the path of the new building’s deep foundations. 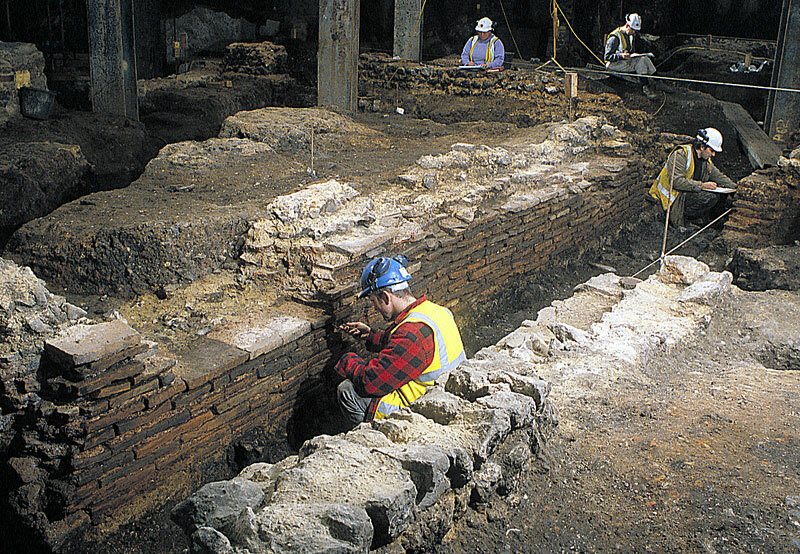 The circumstances of the dig were controversial (the developer bought and demolished a number of listed Victorian buildings to clear the site for his new offices) but the result was the largest excavation in the history of Roman London, revealing archaeology from ancient Londinium’s foundation as a Roman frontier town, all the way to the lost 19th century burial ground of St Benet. We’ll stick with the Roman. The Poultry site is located just across the road north of the Bucklersbury House site. The trench revealed a section of the city just west of where the main East-West road (the via decumana) crossed the Walbrook river. The road then split, forming a busy interchange. Among the most important outcomes of the Poultry dig was that it found the earliest ever evidence for Roman London. 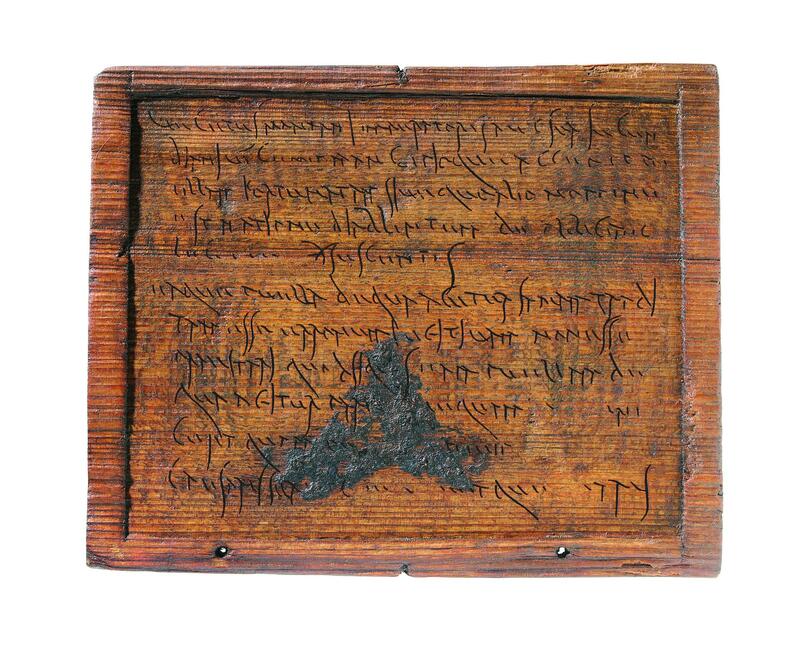 Timber from a drain beneath the earliest road surface was dated by dendrochronology to AD47; five years earlier than the previous evidence suggested and only four years after the Romans invaded in AD43. The area grew up quickly and soon contained a number of timber houses and shops built facing the via decumana. One of the buildings contained Gaulish samianware pottery, and the charred remains of mustard, dill, coriander, fennel and black cumin. It is thought to have been a general goods store. However, this development was something of a false-start. The early city was destroyed by the Boudican rebellion in AD60, and all of the early buildings at Poultry had evidence of being destroyed by fire. Eventually things got going again, and the Poultry excavations provided dendrochronological dates for new buildings starting from AD73. These new timber structures were built on the same alignments and plots as before, showing that property boundaries were being kept track of in some form of centralised land register. The Poultry interchange appears to have been an area of shopkeepers and craftsmen. One building had large amounts of grain on the floor and may be a bakery. Other shops were occupied by carpenters and jewellers. South of the main street was a huge oak-planked tank, which may have been part of a textile mill. This period provided one of the dig’s most surprising finds; the most complete Roman door ever found in Britain (although ours is much fancier)! Evidence of burning confirmed that the Poultry site was again destroyed by a catastrophic fire in AD125. The damage caused to London was comparable to that of the Great Fire in 1666. Because the deposits of Late Roman London are so much closer to the surface than those of the earlier phases of the city, very little has survived. Activities such as digging pits and basements in the Medieval and modern periods have destroyed most of what was there. Fortunately, this did not happen at Poultry. 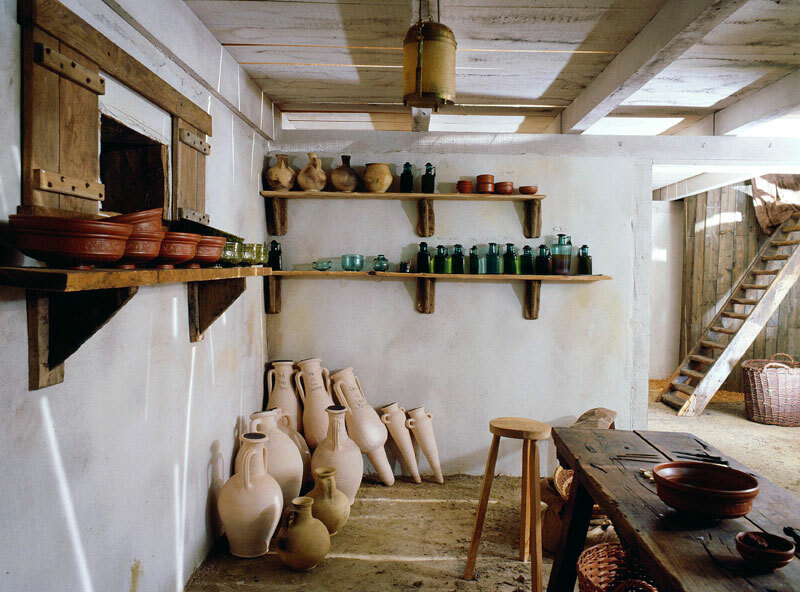 The buildings initially rebuilt in the 2nd century were similar to those from before the fire; long oak-framed buildings with shops facing the street, workshops at the rear and living spaces in between. It was in deposits of this period that the Fortunata tablet was found. 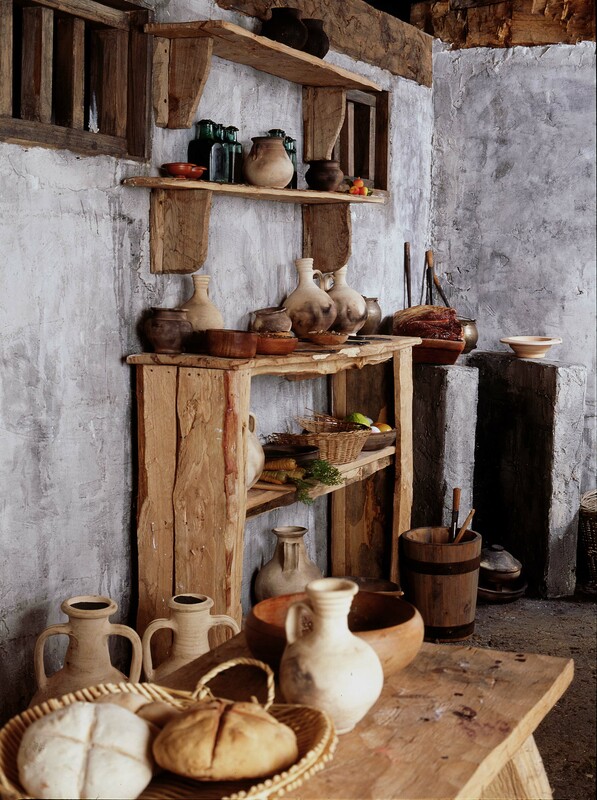 In early 3rd century Poultry was still prospering, and many of the houses were rebuilt with stone extensions in their back yards. 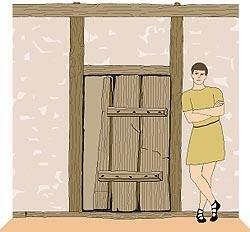 One had a mosaic-floored reception room, whilst another had a bath block with hypocaust, hot plunge and mosaic floors. By 4th century, however, Poultry and Londinium as a whole were in decline. The baths may have continued in use until AD400, but dereliction set in elsewhere. The mosaic panels in one house were neatly cut out, probably so that the owners could move them to a new home in the country. In another, broken roof tiles formed a crude repair to a tessellated pavement. Poultry was eventually abandoned. 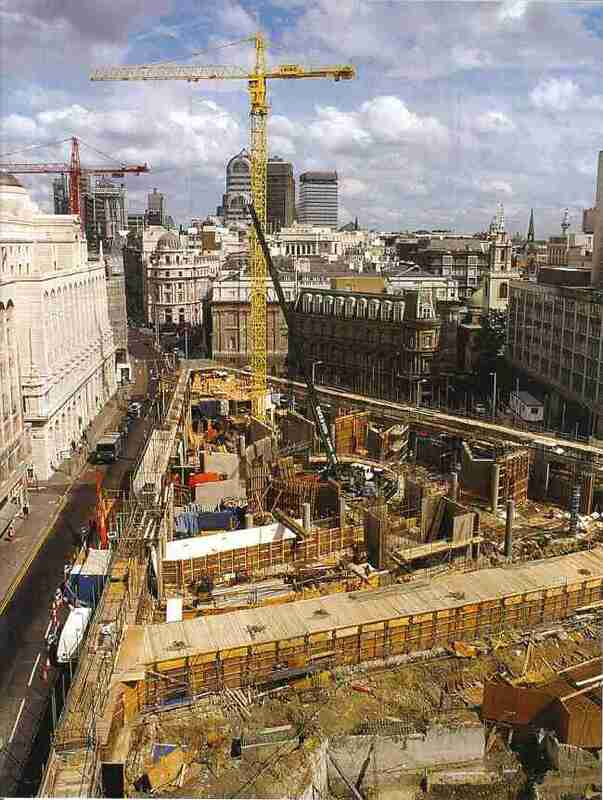 The Walbrook, which had been steadily narrowed over the course of Roman occupation, grew in size again. The site saw no more significant activity until the 9th century. If you want to learn more about Roman Poultry, or the Medieval and Early Modern remains, you could do a lot worse than picking up a copy of Peter Rowsome’s lavishly illustrated ‘Heart of the City’ book or MOLA’s publication ‘Roman London and the Walbrook stream crossing: excavation at 1 Poultry and vicinity’ . Or indeed visit the Museum of London! It’s very kind of you to recommend my popular book. Good luck with the remainder of your excavations!